Patient-centered care revolves around the idea that each patient’s goals, preferences, and needs are different. For pediatric organizations, this extends beyond the patient to include parents and/or guardians. 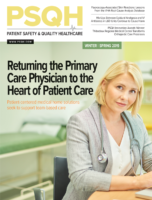 To ensure patient and family needs are met, hospitals should be focused on proactive rounds that not only connect front-line clinicians to patient needs, but also integrates broader hospital resources. Download the latest topical spotlight to hear the story of Akron Children’s Hospital and how rounding has become not only a vehicle with which to understand and act upon patient preferences, but also a key strategy to provide patients and family members with the support they need when they need it.